Designing Universal Knowledge is one of those books you often come back to, not only because of its innovative and universal content, but also because of its original structure and visual attractiveness. Gerlinde Schuller, the author of this piece, is a respected academic which gives lectures and workshops on Information Design in Amsterdam. It is important to add that Schuller is the founder of the famous Dutch Information Design Studio, consisting of academics and graphic/editorial designers. 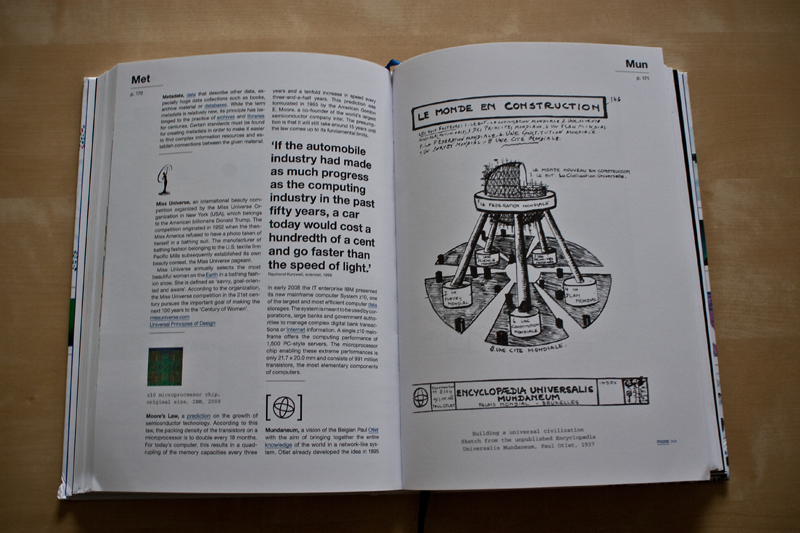 Designing Universal Knowledge exposes the link between the author and her book, presenting how information design and visual journalism melt together forming a masterpiece. The book starts with a short sentence: Knowledge is power. This universal knowledge is in the main focus of Schuller’s study, as the author targets surrounding areas such as: structuring, collection, designing, publishing, manipulation, filtering of knowledge. Furthermore, in her encyclopedia Schuller presents a variety of entries from alphabet to metadata and from Aristotle to hacker, keeping balance between history and innovation. The book also includes various interviews with people related to information visualization and structuring of knowledge, but also essays of such popular academics as Alex Wright, Willem van Weelden, and others. • Who is collecting the world’s knowledge? • How are knowledge archives structured and designed? • Who determines the access to knowledge? • What knowledge entails power? The half academic, half encyclopedic structure of the book is a strong link to the authors background. While looking at the piece from a designers perspective, other stylistic biases can be found, such as Internet (hyperlinks: underlined blue text), print (colorful, fully printed pages), biology (anatomy and animalistic motives), statistics (tables and charts), and history (timelines and plates). Nonetheless most of the book resembles an encyclopedia in the structure of its paragraphs, alphabetical order, and vast amounts of beautiful images. Despite large quantities of academic information covered in the book, it seems spatial and easy to read. The book is a perfect blend of two opposite aspects: complexity of writing and simplicity of representation. 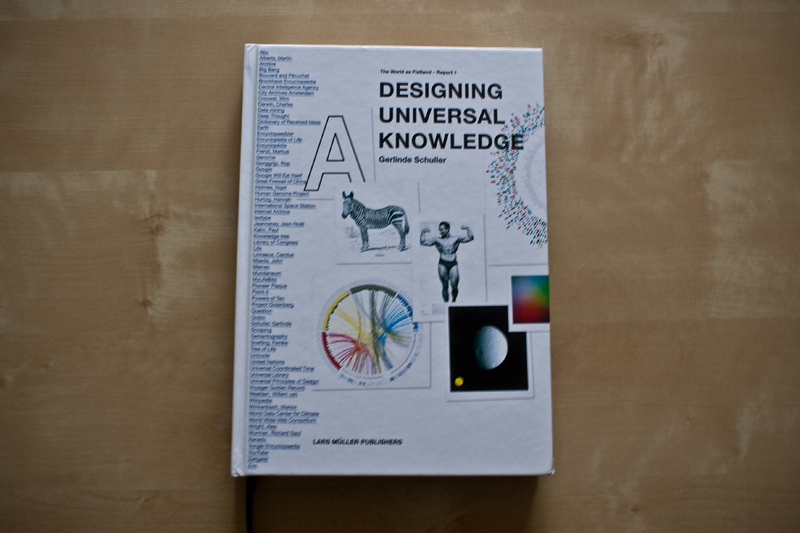 Designing Universal Knowledge is a fascinating encyclopedia-like research paper, which perfectly balances between strict academia and a pleasant to the eye print album. 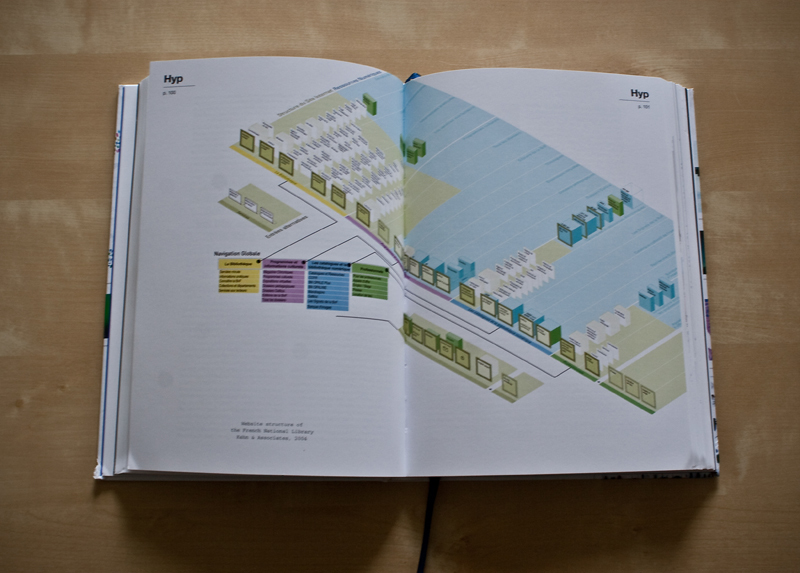 Instead of presenting one clear way of designing universal knowledge, the book is more like a set of guides and related industry dilemmas which leave us exploring and contemplating the topic for hours.